Representative Joe Kennedy spoke during the first day of the Democratic National Convention in Philadelphia. 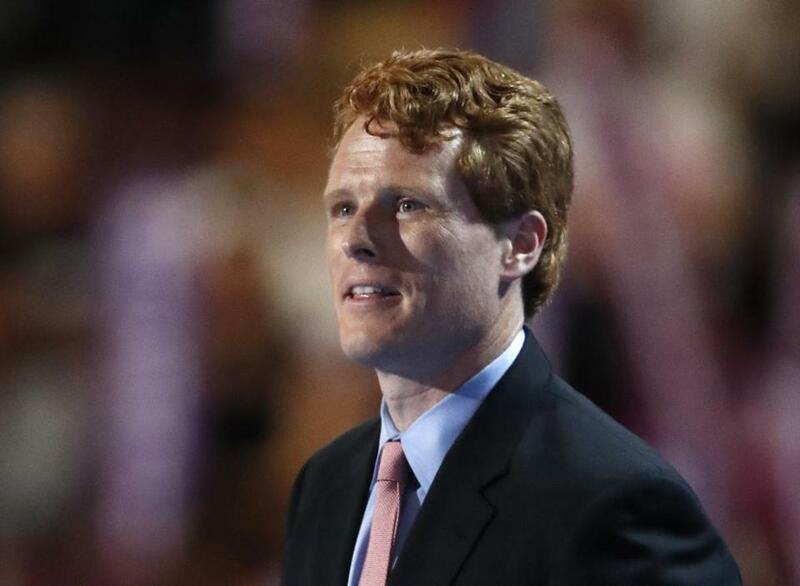 WASHINGTON – Representative Joseph P. Kennedy III, one of the Democratic Party’s rising political stars, has been tapped by top party leaders to deliver the official Democratic response to President Trump’s State of the Union address next week. Kennedy’s speech will be followed by a Spanish-language response delivered by Elizabeth Guzman, the first Hispanic female immigrant elected to the Virginia House of Delegates. Late Thursday, Kennedy said he was honored to be chosen for the role. The choice of Kennedy says something about the image that the national Democratic Party is trying to project. In Kennedy, Democrats are looking toward a telegenic liberal from bright-blue Massachusetts — not to mention a famous political dynasty — to articulate the deep and increasingly-bitter objections many Americans have to the current president. It’s a sharp contrast to the party’s choice last year, when Democrats tapped the septuagenarian former governor of Kentucky, Steve Beshear, who delivered a low-key, bipartisan appeal for Trump to preserve the Affordable Care Act. The swing to Kennedy signals that Democrats are less interested in bipartisan appeals than in capitalizing on the wave of resistance rising ever higher in their base against the president, as well as the dissatisfaction independents feel with Trump. Kennedy’s speech is not likely to be a red-hot anti-Trump screed, however. He is expected to make an appeal to the middle- and working-class voters that Trump promised to take care of but whom Democrats argue have been largely cast aside by the president’s agenda. But delivering a speech following the grandiosity of the president of the United States speaking to a packed House chamber can also be a challenging, thankless task that has often caused bumps in political careers, rather than made them. Governor Bobby Jindal of Louisiana had an awkward walk down a long hallway in 2009, while a parched Senator Marco Rubio of Florida lunged to the left for a mini water bottle in 2013. Beshear last year sat in a Kentucky diner as a more than a dozen stoic residents sat silently behind him, while Senator Tim Kaine’s distracting bouncing eyebrow was the most memorable element of his 2006 response. Kennedy has kept a fairly low profile for much of his five years in the House, seemingly going out of his way to avoid capitalizing on his famous last name. In 2014, he told party leaders that he did not want to be chairman of the Democratic Congressional Campaign Committee. But his profile has risen since Trump’s election and Democrats have found their base clamoring for acts and statements of resistance against the president. Some of the issues that Trump has pushed — repealing the Affordable Care Act, limiting the rights of gay and transgender Americans, and cracking down on the number of immigrants and refugees entering the United States — are the ones that most animate Kennedy. He will be speaking at a crucial moment, as Trump begins his second year in office and as Democrats look to make big gains in the upcoming mid-term elections. Washington has been riven by divisions in recent weeks, with an impasse leading to a brief government shutdown. The temporary agreement to reopen the government for three weeks has provided only a temporary solution. An immigration debate is roiling both parties, with uncertainty over how best to provide clarity for so-called Dreamers, who were brought to the United States by their undocumented parents. Kennedy has not been the most prominent Democratic voice on a lot of issues, running to the cable news cameras far less often than his colleagues. Delivered during an all-night committee meeting on that bill, Kennedy charged that the GOP bills “is not an act of mercy. It’s an act of malice.” The video garnered more than 10 million views on Facebook. The origins of responding to the president’s annual address go back to the 18th Century, but the modern response dates to 1966 when top Republican leaders — Senator Everett Dirksen and Representative Gerald Ford — gave an address responding to President Lyndon Johnson. It has taken different forms over the years — including when, in 1968, 17 Republicans lined up for an hourlong response to Johnson. Kennedy would be the first Massachusetts politician to deliver the State of the Union response since then-House Speaker Thomas P. O’Neill, who took part in a 1985 infomercial of sorts produced by the Democrats. It was hosted by a young up-and-coming Arkansas governor named Bill Clinton. O’Neill was involved in the responses in several other years as well, according to a list compiled by the American Presidency Project. Others from Massachusetts who have been involved in giving responses were then-Representative John McCormack in 1970; Senator Kennedy in 1982, and Senator Paul Tsongas in 1983.